Science has done it again. What humans in past generations would never have thought possible is becoming a reality. Associated Press writer Ariel David recently reported on one of the most advanced scientific experiments ever done in the world of prosthetics. Twenty-six-year-old Paierpaolo Petruzziello was involved in a month-long research project in which scientists used special electrodes to attach a robotic hand to the nerves in Petruzziello’s left forearm. The research team performed the study in order to see if Petruzziello could control the hand by triggering the correct nerves simply by thinking about it. Amazingly, Petruzziello successfully manipulated the robotic hand using his mind. In fact, he stated: “It’s a matter of concentration. When you think of it as your hand and forearm, it all becomes easier” (as quoted in David, 2009). The doctors left the electrodes in the young Italian’s arm for a month. So successful was Petruzziello at controlling the hand, by the end of the month he could “wiggle the robotic fingers independently, make a fist, grab objects, and make other movements” (2009). Research like this underscores the astonishing intelligence necessary to produce a “working” hand. The project cost three million dollars, “took five years to complete and produced several scientific papers that have been submitted to top journals including Science Translational Medicine and Proceedings of the National Academy of Sciences,” according to Dr. Paolo Maria Rossini, the neurologist leading the research (as quoted in David, 2009). Brilliant men and women spent thousands of hours and millions of dollars, combining their immense intelligence and experience, to enable the month-long trial to be successful. Yet “more must be done” to equip the robotic hand to function on a practical level. As amazing as this research is, how many of us would voluntarily swap our “ordinary” human hand for the latest robotic facsimile? The rhetorical answer is: “None of us.” And yet we are being told by the majority of modern scientists and the media that the human hand arose by purely naturalistic, evolutionary processes over millions of years, while the inferior prosthetic hand was intelligently designed. The false evolutionary inference is simply untenable. If the inferior robotic hand necessitates intelligent design, by implication, the superior human hand must necessitate greater intelligence. How long will the greater-scientific world refuse to admit the truth that biological organs and systems can only be explained by an intelligent Designer? Indeed, as with all such research, this latest robotic hand points a steady index finger straight to the God of the Bible. 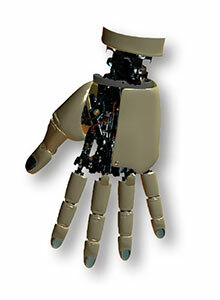 David, Ariel (2009), “Experts: Man Controlled Robotic Hand With Thoughts,” [On-line], URL: http://news.yahoo.com/s/ap/20091202/ap_on_sc/eu_italy_robotic_hand.